Referee: Anthony Taylor - just the second Toon outing for this whistler from the Manchester area this season, following the scoreless home draw with Brighton. Previous to that, Taylor had been at Gallowgate to take charge of our 5-1 thumping of Spurs back in May 2016. There was the usual mixed bag from this whistler: indulging the diving antics of the visitors and harshly booking United's Islam Slimani. Taylor did however avoid cautioning Matt Ritchie for uprooting the corner flag after his winner - opting only to make him go back and replace it. Attendance: 52,210. Another sell-out but over 100 short of the season's highest. Former Magpies in attendance included Gazza, Lee Clark, Stewart Barrowclough and former boss Jack Charlton. Among those representing the opposition were Charlie George, Pat Rice and David O'Leary. Those Gooners round him were rather quiet, with their most audible contribution a second half rendition of "Arsene Wenger, he's won more than you" in response to some baiting. This revivalist banner in the Gallowgate End was accompanied by renditions of "who's that team they call United" - proper old school. We would have loved there to have been one with "Bertie Mee said to Joe Harvey...." on it, but that would have stretched halfway round the ground. 14 mins Shkodran Mustafi's long pass forward from his own half neatly bisected Jamaal Lascelles and DeAndre Yedlin and found Pierre-Emerick Aubameyang down the left channel. 29 mins The move for Newcastle's equaliser began with Dubravka's routine pass to the deep-lying Jonjo Shelvey. He rolled the ball out to Lascelles and then began to stride forward as the triangle of passes was completed by Yedlin knocking it back from out on the right touchline. Still in his own half, Shelvey flighted a fine pass that wasn't dissimilar to Mustafi's and reached the scampering Dwight Gayle towards the right hand side of the Arsenal box. The number 9's first touch took the ball away from covering defender Mustafi but towards the arriving Rob Holding. 68 mins Paul Dummett's throw in down the United left just over halfway was directed to Islam Slimani, but he was out-jumped by Mustafi. His clearing header dropped to Nacho Monreal a short distance away and he in turn headed it on the first bounce to nobody in particular. "We were not expecting to be in the top 10, but at the same time I said we were dreaming, but we were awake and thinking that we could do it. "If you see the way that the players were working for every single ball - and the fans and all the staff - everybody was pushing in the same direction. It's a great achievement for everyone. "I said before about the commitment, everybody was working so hard from day one, every training session, every game, sometimes you were lucky, sometimes you were unlucky but in the end I think they deserved to stay in the Premier League. "I think the first thing to say is to congratulate the club, the fans, the staff, the players, everybody because it was a massive effort this year. "Everybody was pushing in the same direction and I am really pleased because we played against a very good team - we were talking about the changes they made but you could see the quality they had, especially first half; they were passing the ball really fast, really quick, very precise, so we needed to work hard and we did it. "Yes, it is something significant to see the reaction of every single player, even the fans, they had the belief that we could score and we did it and after you could see we were suffering sometimes as it's a very good team so to beat a team like this is very impressive. "Now is a time to enjoy. Then we will have plenty of time to talk about the future but the main thing is to congratulate everyone here." "It is a little bit of the story of the season away from home: we went 1-0 up, we don't put the game to bed and we made mistakes defensively. "But I felt overall today the fact we played on Thursday night, in the second half we couldn't raise the tempo and keep it up in the first half. "That is what happened many times this season, that's all we can say today. It's baffling how we lost this game today because from those chances we lose 2-1. On the other hand, the result is there. "We had lots of other opportunities in the first half and unfortunately there were promising things in our game many times, but we live at the level where we need to be realistic and transform all the chances. "How do we address it? By not making the same errors we have up to now. "It's quite baffling because traditionally we have been very strong away from home. I believe as well that this week we had to give a lot on Thursday night and the players who played on Thursday night you could see the game was a bit in their legs." Newcastle made it four Premier League wins in a row for the first time since November 2014, when Alan Pardew's side managed five. And this current run of four successive home PL victories is the best since Pardew's lot did the same in December 2014, losing at the fifth time of asking. The Magpies remain unbeaten at SJP in 2018, winning five and drawing the other two of seven league and cup fixtures. The last team to win here was Manchester City on December 27th 2017. Rafa Benitez saw his side come from behind to win for the second time this season, following on from the 3-2 success at West Ham in December 2017 - when they trailed after six minutes. However no Newcastle side have gone behind and won a Premier League game at SJP since they conceded to Everton in five minutes but recovered to beat them 3-2 in December 2014 (they did recover from a 1-3 deficit against Norwich in the Championship to win 4-3 in September 2016). 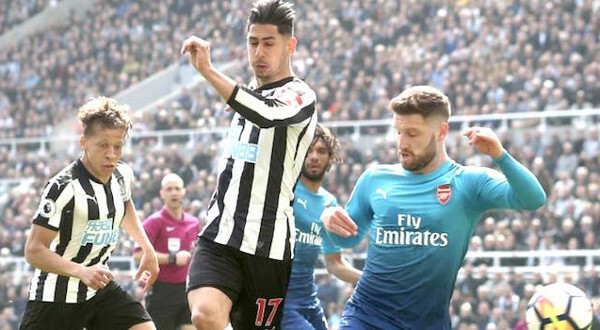 Ayoze Perez scored for the third game in succession and is now joint top scorer in the Premier League this season along with Dwight Gayle, having both scored five goals. Perez is the outright top scorer in 2017/18 having also scored twice in the FA Cup. The Spaniard now has 32 club goals to his name in all competitions since first finding the net at Spurs in October 2014. Today was his 100th league and cup start (+48 substitute appearances). Matt Ritchie netted his third PL goal of the season and now has 18 to his name in all competitions since getting off the mark against Reading at SJP in August 2016. Today marked his 80th game for Newcastle in all competitions (73 starts). Before today, Arsenal had won the most recent ten meetings, United not taking any points since a 0-0 draw at SJP in August 2011. And it was 13 games since the Magpies had beaten the Gunners anywhere - a 1-0 success at the Emirates in November 2010 via the head of Andy Carroll. You need to have a long memory to remember the last time we beat these lot at SJP: Nolberto Solano's goal in December 2005 giving a side managed by Graeme Souness a 1-0 success. Since then, we had drawn four and lost the other six league and cup games before today. This was our 180th competitive league and cup game against the Gunners - more than any other opposition, ahead of both Manchester City (177) and Liverpool (173). This was our 67th victory against them; our third highest tally - four behind both Aston Villa and Manchester City. PS: Apropos of nothing, this victory means that Newcastle have beaten both Manchester United and Arsenal at Gallowgate in the Premier League this season for the first time since 1999/00 when Sir Bobby Robson was in charge. Matt Ritchie emulated Alan Shearer in scoring against both. 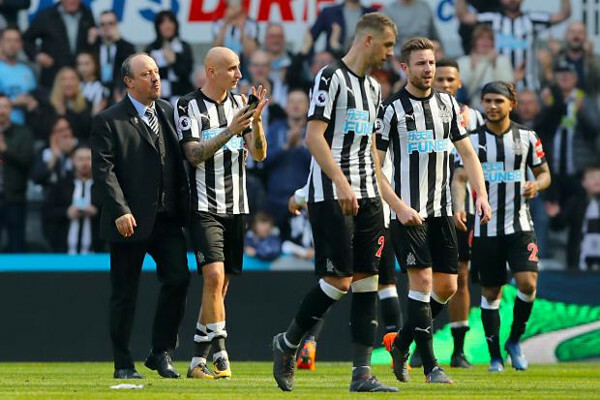 Having all but secured their Premier League status thanks to an excellent win at Leicester City the previous weekend, Newcastle left nobody in any doubt that they will be playing top-flight football next season after a fantastic victory at St. James' Park on Sunday. Their achievement was made even more memorable by consigning a woeful record against Arsenal to the dustbin of history: Arsene Wenger denied what would have been his eleventh successive victory over United and leaving Tyneside empty-handed for the first time since 2005. They also boasted a front pair that cost over £100m and a striker on the bench bought for £16m in 2014. That strike duo combined to put the visitors ahead and at times their flowing moves and passing was impressive. Despite their manager's well-worn protestations (and myopia) though, Arsenal were beaten fair and square by a team demonstrating equal skill and superior spirit. This was not a fluke. Behind for just 15 minutes, Newcastle levelled thanks to another inspired finish from Ayoze Perez - the Spaniard one of a clutch of players whose "marks out of ten" rating has radically improved. And as he had done here against Manchester United, Matt Ritchie provided the finish to take the Magpies through that all-important 40 point barrier, not only delighting their boss but also claiming another big scalp en route to what could now even be a top half finish - something beyond any imagination when a 0-1 loss at the Emirates in December made it nine games without victory. Unchanged for a fourth successive game - which has to be a factor in our resurgence - Newcastle played with the determination and confidence that has lifted them well clear of the relegation zone and mercifully put an end to endlessly checking scorelines and scenarios elsewhere in the league. For once, it's all been about us: our efforts, our preparation, our achievements. The second half was quieter until the arrival of Islam Slimani for Gayle but his impact was immediate, instantly winning a free kick to underline his street-wise credentials. After the runs of Dwight Gayle to reach Exocet-like through balls from Florian Lejeune and Jonjo Shelvey, Newcastle were able to target the visiting defence in a different way, the substitute contesting aerial challenges. That proved to be the difference midway through the second half, Slimani's sheer determination to win the ball and mount an attack seeing him get to the ball towards Perez. His subtle touch to help the ball on (at first glance it looked like he'd left it alone) set up Matt Ritchie to score a mirror image of the goal that saw off Jose Mourinho's side in February. It was certainly celebrated as much. Like the current clamour for Gareth Southgate to ring our captain, we're totally unmoved by the calls for Shelvey to spend his summer in Russia and content that his new-found consistency is extending not only to playing at a high level week after week but also behaving himself. There were still 25 minutes to see out, but the visitors barely threatened a response and instead it was United who came closest to scoring another; the apparently knackered Kenedy summoning up the energy to scamper goalward before seeing his deflected effort loop up and off the crossbar. Full time prompted scenes of celebration that echoed those of 12 months before, fans remaining in their places to acclaim their conquering heroes - who themselves looked rather chuffed at having managed to summon up another memorable day. And among them was the gaffer; glasses in pocket, handshakes, offering words of consolation or congratulation to players of both sides. The words dignified and Newcastle United don't often crop up in the same sentence: it's hard to imagine Rafa nutting someone or offering fans out. It's incredible to think we were ever in danger of going down, but before this remarkable upturn in fortunes that was a very real prospect. Thankfully some collective responsibility saw us turn the ship around, epitomised by the true grit of Mo Diame - no more the poor man's Sissoko. The transformation Rafa has overseen is nothing short of stunning and great credit is due on and off the pitch for the effort and energy expended. This is a team who genuinely care and the backing they received when results weren't forthcoming has now been repaid. What happens next is anyone's guess but if we're still in the mood for score-settling, some form of natural justice on Monday night against brown envelope man would be well received. The prospect of all four sides of Goodison Park abusing the current Everton manager is also one to savour.